This guide presents voters with a citizen’s perspective on a number of upcoming ballot measures, and provides recommendations on which candidates to vote for in the City of Grand Junction’s Municipal election on April 7, 2015. Recommendations are evaluated based on what residents feel is important to their quality of life, safety and welfare, and the best economic interests of our area. City of Grand Junction Referred Measure 2A: Restoring authority to the City to provide high speed internet and cable television service, either directly or indirectly, with public or private sector partnerships. 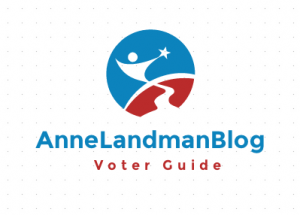 Explanation: This ballot measure allows the City to ignore SB 05-152 (pdf), a stupid law passed by the Colorado legislature in 2005 that prohibits municipalities from providing cable TV or telecommunications services, like broadband internet service, in any form to anyone. Fortunately, the law has a loophole that allows municipalities to opt-out of the law as long as they hold an election asking people if they want their city to opt out. The City of Grand Junction has its own broadband network in municipal buildings, but under the above-mentioned stupid state law, they can’t offer free wifi to citizens in their buildings even though the network is there. The city’s broadband network even runs into its streetlights, but the because of the stupid state law, the City can’t share the network with citizens. That’s just ridiculous, especially since we already pay for it through our taxes. Approving this measure would let the City share its network, so people can get free wifi downtown. It will also let cable companies install and repair fiber optic lines during city construction to improve streets. Since we’re all stuck with Charter Communications for high speed cable broadband internet and Charter has no competitors in this area, we need to opt out of the state law. Explanation: This measure authorizes the city to take on $14.5 million of additional debt to finance more construction on the Westside Beltway project, also known as the Riverside Parkway. The City wants to continue the Riverside Parkway, starting where it currently ends at 25 Road and the I-70 Business Loop, extending it north up 25 Road to F 1/2 Road, then west to 24 Road, and up 24 Road to I-70. The City wants to finance the project by keeping taxpayer funds that would normally have to be paid back to citizens under the TABOR Act (the Taxpayers’ Bill of Rights). The measure sounds fine at first read, but we recommend a “No” vote on Measure 2B. Businesses on 25 Road oppose 2B, but the Grand Junction Area Chamber of Commerce supports it. First of all, City Council failed to inform business owners along 25 Road about the project. The City didn’t even bother to contact affected business owners until well after Council had already voted to put the measure on the ballot. By then, it was too late for businesses to weigh in on it. That’s just wrong, and we wonder why Council kept the measure under wraps until it was so late in the process. Affected business owners deserve to be notified about it sooner rather than later. “They blindsided us,” says Steve Stewart, owner of The Foreign Aid at 574 25 Road. “We didn’t even know anything about this [Measure 2B] until a week ago,” Stewart says. Had it not been for word of mouth, he says, business owners and residents along the proposed Parkway route wouldn’t have heard about it at all. 25 Road business owners are angry over the way the City sprang this project on them, and who can blame them? Originally the Riverside Parkway was going to continue on down River Road straight to 24 Road. That would seem to be the logical route, since it continues the existing Parkway straight to 24 Road — no curves or corners, just a straight shot, with fewer businesses affected. Instead, for some reason now the City wants to zig-zag the Parkway through more heavily developed areas where there are already established homes and businesses very close to the road. It seems a little fishy. Other people think the City is just spending too much on accommodating vehicles and extending this one route while neglecting longstanding, glaring needs in other parts of town, and the needs of people themselves. For example, three pedestrians have already been killed while crossing Horizon Drive, and no announcement has been made of plans to make that area safer for pedestrians. Why not? How many more people have to be killed on Horizon Drive before the City takes pedestrian safety seriously there? There are also two schools very near one another on 24 1/2 Road by G Road (Caprock Academy and Juniper Ridge School) and no sidewalks in the area to accommodate kids walking to school. There are also no sidewalks on G Road, which leads to both schools, two churches, a city-owned walking path and Canyon View Park. 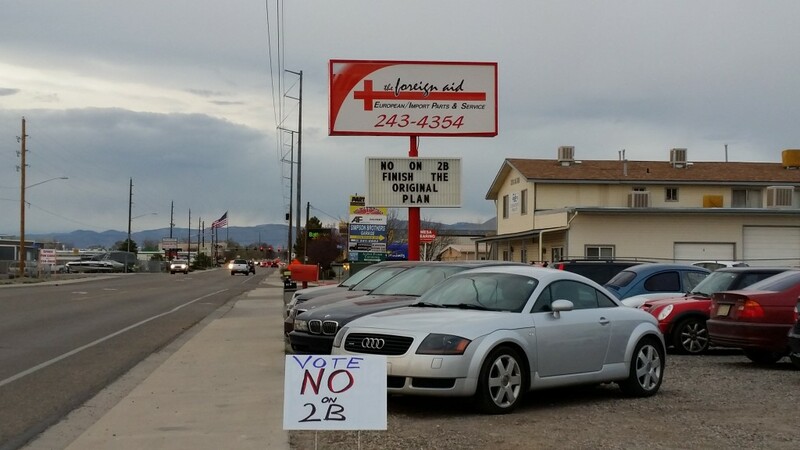 In keeping with their long-standing tradition of opposing the interests of locally-owned businesses, the crazy Grand Junction Area Chamber of Commerce supports 2B, even though most business owners all along 25 Road strongly oppose it. People Want a Rec Center Instead! Fruita’s Community Center — Wouldn’t you love to have something like this in Grand Junction? The message has been loud and clear for a long, long time, but City Council never listens to it: Many citizens think it’s beyond time for the City to build a public Community Center. Community Centers tremendously enhance city residents’ quality of life, and Grand Junction citizens deserve one. The City of Fruita built an awesome new Community Center with indoor basketball courts, an elevated lap track around the basketball courts, a weight room, an exercise gym equipped with treadmills, stationery bikes and other exercise equipment, an indoor pool with a slide, a lazy river, “hydrowall and the floating alligator,” a shallow area for kids, a separate lap pool, a hot tub, a climbing wall, tots area volleyball courts, and an outdoor pool with sun deck. It has a senior room with kitchen, pool table and other amenities and a dedicated child-care area. The community center hosts meetings, birthday parties and private get-togethers in their meeting rooms. Wow! 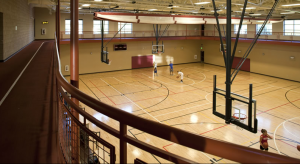 Fruita Rec Center’s indoor basketball courts and elevated walking track around the courts. Who wouldn’t want a terrific facility like this? Why aren’t G.J. citizens worth this? What a boon to Fruita! 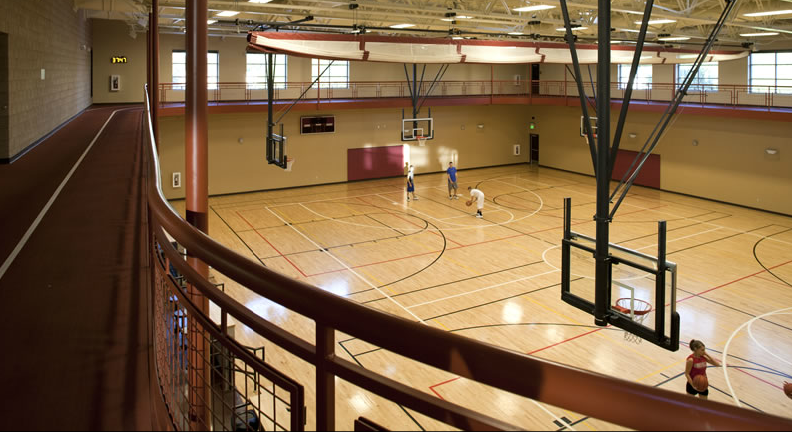 Many Grand Junction citizens are driving to Fruita just to enjoy their wonderful rec center. But why is Fruita so far ahead of Grand Junction in this respect? 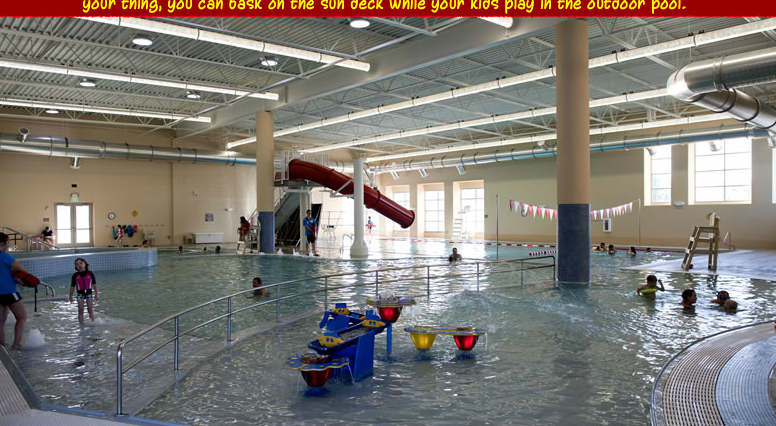 Delta has a similarly wonderful public recreation facility, the Bill Heddles Recreation Center. 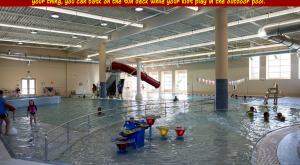 The City of Montrose just built a public recreation center, too. Durango has one, too. Many people in Grand Junction are left wondering why their City just won’t provide this kind of wonderful amenity for its citizens. In short, there are a lot of good reasons to vote NO on G.J.’s Referred Measure 2B. We need to re-think priorities when it comes to capital improvements in town and how citizens are treated in our community. Cars aren’t everything. People are worth a lot, too. There are only two contested races for City Council. They are for the two at-large seats. In the race between Chris Kennedy and Dennis Simpson, we urge a vote for Chris Kennedy. His priorities are more in line with citizens’ needs and desires. Simpson is a tight-fisted conservative who will want to slash budgets and impose fiscal austerity. We don’t need any more of that. It’s time for Council to start working to improve citizens’ quality of life and move this community into the 21st Century instead of bringing in more people who are just single-minded budget-slashing machines. The race between Kim Kerk and Rick Taggart is a toss up. It seems to be a choice of who will be the least harmful candidate, as they both have significant drawbacks. While it would be nice to have another woman on Council and Kim Kerk doesn’t seem to have anything particularly heinous in her background, she works for a developer, Blue Star Industries (in the little pre-fab building with the monster-sized flag on 25 Road). This could pose a conflict of interest if she serves on Council, since Council rules on land development issues. Taggart used to be the CEO of the Swiss Army Knife Company and worked for Marmot Industries. 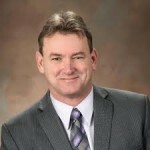 He now works for Colorado Mesa University (CMU). Since 2011, CMU has mysteriously benefitted from a lopsided amount Federal Mineral Lease District funds ($4.2 million so far, as of March 10). Some people feel this preferential siphoning of federal money to CMU may be due to favoritism towards CMU President Tim Foster by the area’s entrenched Republican Good Ole Boy network. Indeed, given all of this area’s citizens’ dire needs, it could be of great benefit to the larger community if CMU stopped sucking up quite so much of those funds. While Taggart’s employment background is less conducive to conflicts of interest with regard to land use issues, his election to Council could mean CMU would gain even more influence over local government, and government funding, than it already has, and that’s not a good thing. We may we’ll have to leave this choice of two evils up to readers to decide.